The Art of Mandala and Zentangle helps to heal. Watercolor Wonders I- Beginner workshop (little or no experience required) Experience the joy of watercolor painting. This workshop is designed to inspire your success with a new medium. Are you curious about the versatility and gifts of watercolors? You will learn techniques, how to create magic and have some fun with this delightful medium. You will become familiar with watercolor materials, color mixing and painting techniques in a fun and relaxed atmosphere. Don’t be intimidated any longer – come learn to paint! Private study is available. Opportunities for individuals, homeschoolers, and others! Where- Create Art 4 Good Studios located at 1115 E. Main Street. (Create Art 4 Good is in the historic Hungerford building at the corner of Goodman and E. Main Street) Please walk toward the smokestacks enter through door #5. You can find this behind door #4 which is parallel to the flagpole in the parking lot. The suite is #203 – the second floor, left at the glass door, right down the little hall. Susan Carmen-Duffy is the owner of Create Art 4 Good. As an artist, she has explored the strengths of each medium and the magic of applying them together. She feels that each human has creativity within and should take time to explore their artist heart. Her work is widely collected throughout the United States and Europe. Susan shares her work through her own gallery, local galleries, and other opportunities. You can find her art and design on any of over 200 designs for her company, “Greetings 4 Good”. Bring- You are welcome to bring something to drink or something to snack on as you wish. Water, coffee, and hot tea are available at the gallery. Everything you need to create some fun and wonderful art will be provided. Also provided are special Create Art 4 Good aprons to protect your clothing. The inks and paints we use will stain, you may wish to wear older clothes. Doing good things! I’d like to share with you that 20% of your workshop fee goes to support “The Barbara Carmen Creative Experience Fund”. This offers an opportunity to those being treated with breast cancer to enjoy a workshop at Create Art 4 Good free or at a reduced cost. Thank you for your support! We offer many opportunities! Look through to see what you would like to schedule for your team building, wedding or baby shower, birthday or just a fun occasion! Meditation and Meditative drawing Meditation is a profound spiritual practice that can be employed in any walk or stage of life. It has been proven by medical science that the act of meditation has profoundly positive effects on physical and mental well-being. This workshop begins with a brief meditation and then launches into a more active form of personal meditation. Using the principles of Mandala and Zentangle you are invited to create your own personal artistic mediation. Meditation and meditative drawing is a workshop that allows everyone (no artistic talent required) to explore in a safe and meditative environment explore self, your joys, your sorrows the creation of your mandala will be an experience like no other. Creating a wonderful piece of art as a form of active meditation that quiets your mind and allows you to journey within making the invisible visible. We will create using graphite, colored pencils & ink. Meditation & Prayer Flags Create an active prayer! Place your cares and concerns on a piece of fabric and then release those cares to the universe! Our cares and concerns know no season, you may hang your prayer flag outdoors winter, spring, summer or autumn! Prayer flags date back thousands of years, to pre-Buddhist Tibet. Traditionally primary colors were created on cloth. Symbols and writings embodied the elements – earth, water, fire, air & space. The flags were used for healing ceremonies. This workshop invites you to create your own prayer flags. We will create on pre-stitched cloth and use a more contemporary mixed media approach to this spiritual art. NO experience is required it is only necessary to bring your sense of adventure with you. What might you create a prayer flag for? Your intent might be for peace in the world, a burden on your heart or simply for light in the world. Your options are limitless. Gratitude Journal Workshop- Gratitude as a way of life is inspired by consciously noting every possible blessing. How easily we forget the richness of our lives when we are faced with profound challenges. Gratitude offers perspective. In this workshop, we will create gratitude journals that will serve as a platform for your thoughts on gratitude. After the completion of the workshop journal prompts will be shared with each participant. No artistic skill is required, this is easy and accessible to everyone. Participants may way to bring old greeting cards, ticket stubs, photographs, and other ephemera. You are welcome to bring your own lunch or snacks to enjoy while working on your journal. Garden Journal Workshop Be inspired! The growing season is here! There might not be anything better than keeping track of the success of your garden by noting the plants, seeds, and growth of your gardens not to mention having the opportunity to draw or photograph it. During this day-long workshop, we will create a beautiful journal for you to do just that! We will use a variety of papers (some of which you create), collage and found materials to begin your official garden journal for 2019. How wonderful to have detail recorded in one beautiful place. We will even create pockets to hold photographs, seed packets, and sketches. You are welcome to bring your own lunch or snacks to enjoy while working on your journal. Paint and Pour with canvas Be inspired to create your own version of a masterpiece! This adult painting workshop will walk you through the creation process of your own painting. Bring an idea of your own or work with one of the inspired ideas found at the studio. You will learn a new skill or two, and create one-of-a-kind work of art! Workshop fee includes all materials, step by step instruction, and aprons. Please dress appropriately acrylic paints stain cloth. Think baseball cards with artistic flair! Create small pieces of art that you trade for other people’s small pieces of art. This is not only fun, it is therapeutic and a great way to collect art from those you admire! The ATC movement developed out of the mail art movement and has its origins in Switzerland. 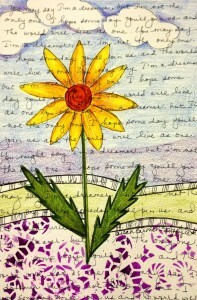 We will create cards in a variety of media, including pencil, colored pencil and watercolor. There will be an opportunity to trade cards if desired at the end of the workshop. Paint and Pour: Paint your own BEAUTIFUL custom wine glasses! What’s not to love about drinking out of a beautifully painted wine glass? The only thing better is if YOU created it! This workshop is easy and fun! You will learn step by step techniques to create your very own beautiful glasses. Prayer box- Begin with a wooden box and create a unique mixed media work of art that houses your dreams, cares, and wishes. You will have the opportunity to choose from a variety of sizes and shapes of premade boxes and then use the techniques of painting, collage, and assemblage to embellish and create your own beautiful prayer box. This workshop is accessible to any skill level, no artistic flair required to create a successful beautiful prayer box! Feel free to bring something to drink & Munchies- make it a party!